Last week I browsed the Dayton, Harbor Freight Tool Store, ... sort of like walking around a grocery store….. Walking every isle. Looking for something to buy … Big spender me, I found these for $3.99. Really handy little things. Needle sharp, find myself using them allot more them I could imagine. They are a great complement to my needle file collection. Maybe a future review. I’ve seen these on the shelf as well. It seems like dental picks come up often in articles about nontraditional woodworking supplies. I think I’d use then for the same uses as what I use my tiny files for. The obvious use for me is getting glue out of tight spots. Detailed carvings (not my realm) would seem to be a good use as well. they can be as handy as they can be cruel. 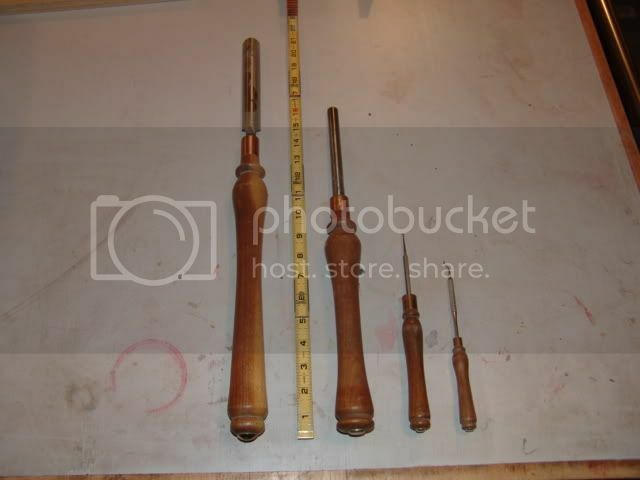 I have these as well, and have gone so far as too make handles for them. This allows me to use them with miniature turnings. They are very handy for many purposes, plus they make great toothpicks! I recently “picked” up a set at the Super Grit store in Gettysburg. You guys are something else. We’ve all used these forever. I’ve never bought any at harbor Freight. But I’ve bought some at the woodworking shows. If those vendors still show up. A new harbor freight store is opening about 25 miles from me. Then it won’t be a full day trip. Picks are really handy I keep one close on my work table. Think I’ll get some more on the next to HF…65 miles one way so the trip has to be combined with something else need from that town, Terra Haute, Indiana. You just have to watch what you buy from HF their corner clamps are junk, my son and I both bought 4 1/2” grinders there and when you turn either on a shower of sparks comes from their insides….not safe to use either one. WOW – A new Harbor Freight will save a day long trip. Maybe they will have a concierge! Thanks for reminding me that tools do not have to be expensive or full of hype to be useful. Dan, they look more like torture implements. Are you in the medical business?. These things are great anywhere. I travelled on a sailboat for three months and Dentist tools were probably my number one item! They’re great for cleaning all sorts of small spaces and can somehow be used to fix almost anything that breaks on a boat! Dan: I bought 2 sets on Tues on my trip to Harbor Freight. 1 set for my bench and one upstairs for the veneering room. I’m still using them almost every day.